This time the brand Ulysse Nardin pleased its fans with a novelty Caprice Butterfly. This graceful elegant model features a butterfly on the dial. It is impossible to pass by such a fine work: soft azure shade interspersed with blue and cornflower blue, enamel dial, in the technique Champlevé, delicate cut diamonds weighing 3.8 carats. Caprice Butterfly is the epitome of craftsmanship and hard work of designers and watchmakers of manufacture Ulysse Nardin. The rectangular case of the model is made of 18-carat white gold, set with diamonds. The originality of the novelty is the dial, which is the image of a butterfly, which embodies the heavens and the earth. Technique Champlevé, in which the dial is made, is a merge of bright colors, color depth and a clear outline drawing. The dials in this technique are performed manually. This is quite a difficult job, sometimes even referred to jewelry work. To create these dials are special grooves that are the result of the engraving. Then have them consistently filled with enamel of a shade, excess paint is removed, and the dial is baked in the oven to get the desired color of the enamel. The resulting figure is fixed openwork metal plate, emphasizing every detail. After such hard work drawing on the face as it begins to "play" and comes alive with bizarre colors. That is exactly how the image of a butterfly in the new Caprice Butterfly watch has been made, which a sapphire crystal closes. Indication of hours and minutes are carried out by means of two central partially skeletonized hands. The model comes on a leather strap in dark blue with a gold clasp. The novelty Caprice Butterfly by Ulysse Nardin is a live model, a reflection of the character of its owner - light, bright and cheerful. The novelty is released in a limited edition - 28 items. 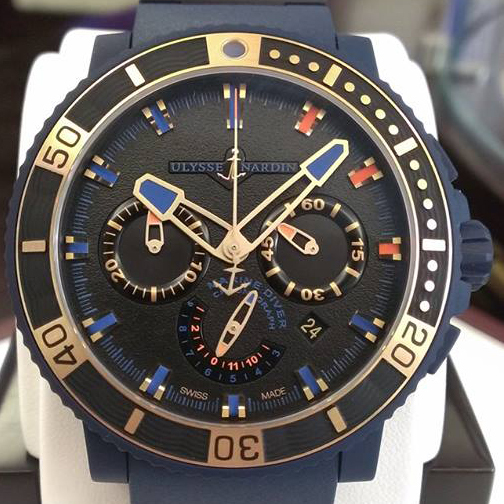 Official website of Ulysse Nardin watches.